‘David Milne: Modern Painting’ will document an artistic career that spanned the first half of the 20th century, bringing together more than ninety works in oil and watercolour, never-before-exhibited photographs and drawings by the artist, and memorabilia collected by Milne during his time in Europe as an official war artist. Following Dulwich’s revelatory ‘Painting Canada’ show in 2011, which introduced work by Milne’s contemporaries Tom Thomson and the Group of Seven, and ‘From the Forest to the Sea: Emily Carr in British Columbia’ in 2014, this exhibition will present the singular trajectory of a legendary Canadian artist, as he makes his voyage into modernity. Arranged chronologically and topographically, the exhibition will follow Milne’s artistic development as he moved from the bustling sidewalks of New York to the war-torn landscapes of northern France and back again to the woods, fields and skies of the northeastern US and Canada. 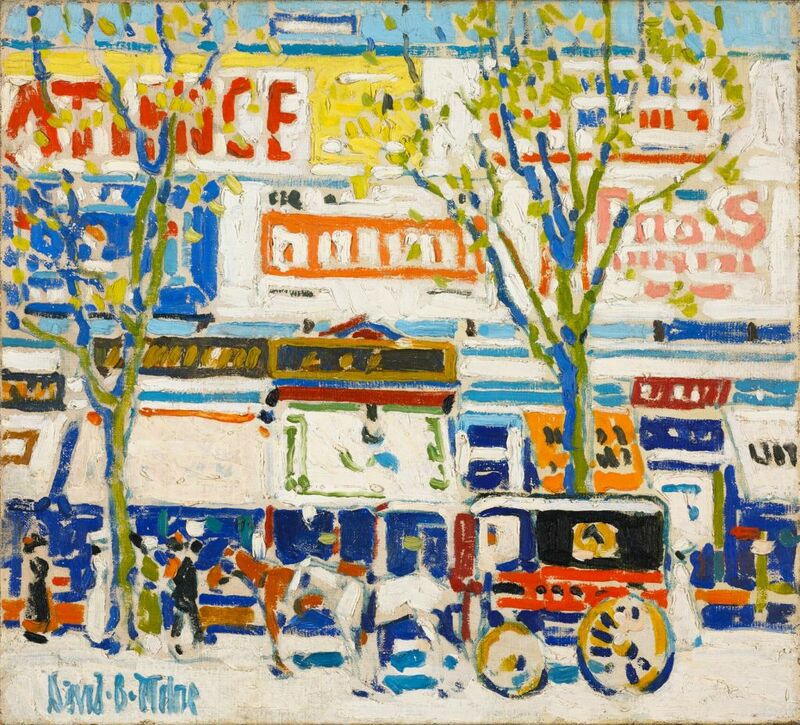 It will document the change in Milne’s approach as he moved from the Post-Impressionist style of his New York years, with its vivid colours and dynamic brushstrokes, to the more distilled visual language of his later work. Milne grew up in a log cabin near the farming community of Burgoyne, Ontario, moving with his family to the small town of Paisley at the age of ten. Milne’s sudden and ambitious decision to leave his home and travel to New York to attend art school in 1903 at the Art Students League was, as he described it, like ‘plunging into the sun,’ an immersion in a completely new life in the bustling metropolis. It is in New York that visitors will first encounter Milne, with the exhibition opening with a selection of his striking depictions of the city’s busy sidewalks and advertising hoardings. He was included in the landmark Armory Show of 1913 where works such as Fifth Avenue, Easter Sunday (1912) were exhibited alongside paintings by Matisse, Braque, Monet and Van Gogh. In 1916 Milne’s reclusive temperament lead him to abandon city life, and a series of his landscape studies made at Boston Corners, in upstate New York, reveal him in a more contemplative mode, applying the artistic lessons of New York as he captured the varied moods of nature in near-abstract works such as The Boulder (1916). The central rooms in the exhibition will showcase some of the most formally daring works of Milne’s career, revealing a shift in his style as he sought to record military training camps in the UK and later, the recently emptied, war-ravaged landscapes and villages in France and Belgium for the Canadian War Records. In battlefield watercolours such as Montreal Crater, Vimy Ridge (1919), Milne deploys blankness as a strong compositional feature, affording it centre stage as he struggles to describe in paint the stark realities that confronted him. The lingering legacy of Milne’s experiences in Europe would continue to charge his way of seeing in the years to come. The final rooms in the exhibition follow Milne‘s return to North America in 1920 and his intense creative interludes spent living in isolation in a hut on Alander Mountain behind Boston Corners and later, camping near the small mining village of Temagami in Canada. Both periods deepened Milne’s explorations of the natural world and his place within it. He spent much time alone, creating works that explored the extremes of subject matter. The exhibition concludes with a series of elemental still-life studies and sky paintings made during Milne’s time at remote Six Mile Lake. Again he built himself a cabin to live in alone, and there his creativity was unleashed anew in works that express a profound connection to the natural world. For the first time, he enjoyed sustained contact with like-minded artists, curators and critics in Ottawa and Toronto, with whom he corresponded, and in 1934 he finally began showing his work commercially in Toronto. He was starting to find recognition at last as one of Canada’s most distinctive and sophisticated modern artists.